Meetings remain a necessary way for us to communicate information, build relationships, and sell to our customers. BUT, like with many things in life, there is a degree of risk associated with them, and where there’s risk, there’s also the responsibility of those of us in the industry to mitigate that risk. And the risks we are talking about are to life and limb, to the brand your organization has taken so long to build, and to the bottom line. 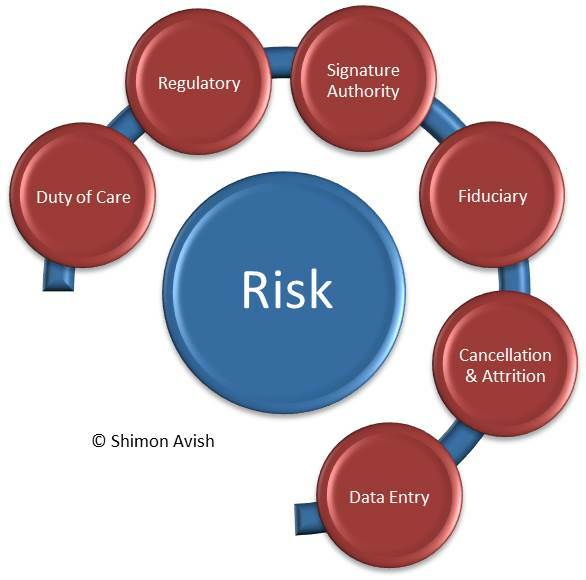 Duty of Care Lapses – put employees at safety risk, expose the organization’s brand, and put it at financial and legal risk. This is a risk area with many components, including the safety and security of meeting attendees, exposure of the brand to negative attention (think AIG and partridge hunting), financial exposure through misappropriation of funds or legal exposure resulting from employees caught in the act of bribing foreign government officials, or the lawsuits of survivors, suing because their loved ones died in a fire in a hotel without sprinklers. Regulatory Violations – expose the organization to government penalties and oversight. For example, between the years 2009-2012 pharmaceutical companies paid penalties of close to $9B for improper promotion of their products. While the bulk of these fines were imposed because of off-label promotion and misbranding, illegal marketing and promotional activities (which take place at meetings) were often a component of the prosecutions. Important regulations to be aware of are (1) Foreign Corrupt Practices Act, (2) UK Bribery Act, (3) Physician Payment Sunshine Act, (4) Financial Industry Regulatory Authority / National Association of Securities Dealers Rules, and (5) Corporate Manslaughter & Corporate Homicide Act, each of which can leave your organization exposed financially and legally. Signature Authority Breaches – put your organization at risk when employees contractually commit to venues above their signing authority limit. The best example I can think of is from an account I worked on a number of years ago. It was late Friday afternoon when an administrative assistant signed a venue contract worth $1.2M. On Monday morning she gave the contract to her VP Marketing, who had over the weekend decided to move the sales event from Houston to Dallas. The administrative assistant called the hotel to cancel, and was told the penalties would amount to $700K. Needless to say, a great hubbub ensued, which was eventually resolved in the client’s favor. Signature authority levels go up along with level in organizational hierarchy because higher levels are better able to make an informed decision regarding the amount of risk a corporation is willing to take on, given that they are more cognizant of the corporation’s appetite for risk. Fiduciary Responsibility – leads to missed savings opportunities and potential improper usage of funds. This is a two-pronged problem. On the one hand, many organizations are missing out on significant cost savings of 15-25% by not have dedicated sourcing specialists aggressively negotiating their hotel contracts, and on the other hand, many organizations are exposed to improper usage of funds due to inadequate processes, controls and audits. Some of the examples raised by internal audit departments over the years include the redirection of funds by meeting owners to family members, fraudulent use of corporate and/or meeting cards, acceptance of hotel rewards (flat screen TVs) by meeting planners, and onsite upgrades by meeting attendees. Cancellation and Attrition Penalties – incur considerable financial risk, since 25% of all meetings are cancelled. While working on a global account, I witnessed a number of instances where events were cancelled, and it was only through the application of protective cancellation clauses in the hotel addendum that the company avoided penalties in the hundreds-of-thousands of dollars each time. Inaccurate Data Entry – leads to improper reporting to senior executives, compliance monitors, and downstream security systems. Dozens to hundreds of data errors can be entered into your data collection system without proper oversight. This topic was discussed in detail in my previous post of data quality, which can be found here. As you can see – this is a big subject. Following are just a few things that you can do at home to see if your Meetings program is at risk. Well that’s it for this post. Tune in next time when I will address some of the mitigation strategies that can be used to address these potential problems.